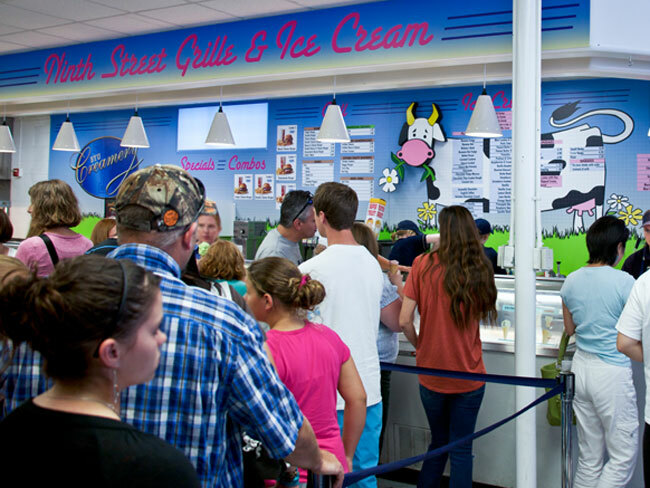 Brigham Young University, in Provo, Utah, produces 185,000 gallons of ice cream a year. Standard flavors like vanilla, cookies and cream and cookie dough sell best, but staff at the university creamery aren’t afraid to create their own, more adventurous flavors, such as a spicy apple pie version. The off-beat treat, combining the flavors of apple pie and hot peppers, went over surprisingly well, says foodservice director, Dean Wright. “It had the sweetness of the apple, but as you swallowed you got that heat from the hot pepper,” he says. 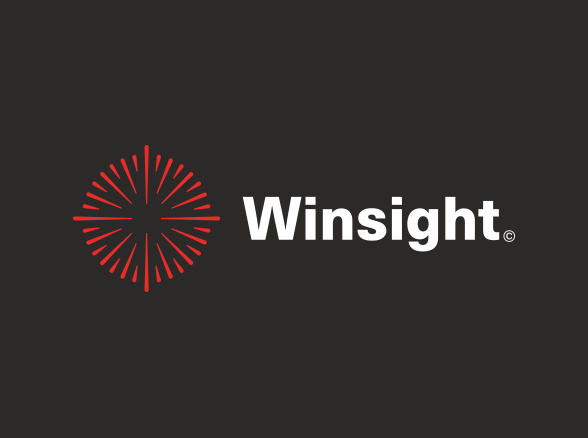 “We have a rotation of about 36 flavors,” Wright explains. The school’s recipe book includes some 200 ice cream formulas that have been offered since the university started producing its own ice cream in 1948. One flavor, Scottish oatmeal with caramel, was developed to honor poet Robert Burns. Mint brownie is one of BYU’s newest frozen concoctions. 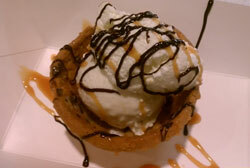 The rendition, which features pieces of brownie and chocolate, is already a top seller. Wright says that the university’s ice cream is so loved by its students that dining services ships it all over the country to alumni. In addition, during televised football and basketball games, the school conducts a trivia contest and winners are sent BYU ice cream as a prize. “Our ice cream is something that the university is proud of,” Wright notes. BYU sells its ice cream in its two residence hall cafeterias, at the school’s four convenience stores and in one grocery store. Several off-campus restaurants, including a pizzeria, also serve the school’s ice cream. Stellar ice cream: At the University of Maryland in College Park, the newest specialty ice cream flavor is Star Spangled Explosion, which is available for the next two years. Dining Services developed the flavor to commemorate the 200th anniversary of the War of 1812, says Dining Services’ executive pastry chef, Jeff Russo. The university has been making ice cream for 88 years, and Dining Services took over production eight years ago. A local co-op dairy farm prepares the base. By “hand-crafted” Russo means, “we actually do all the folding and blending in of flavors and particulates by hand, rather than pouring everything into a hopper.” Folding by hand gives an even distribution of additional flavors and treats, Russo explains. For a Vani-Loh Mango ice cream that was developed for UMD’s President, Dr. Wallace Loh, vanilla bean and mango ice cream are swirled together with a hint of dark rum. “Our newest sport flavor is Rockin’ Randy, which is named in honor of football coach Randy Edsall,” Russo says. “Coach Edsall informed us of the flavors he prefers”—vanilla chocolate chip ice cream with chocolate marble swirl—so Russo took those and added Reese’s Peanut Butter Cups and Heath Bar pieces. Baked goods: At the Sallie Mae call center in Newark, Del., a Eurest account, Chef/Manager Brent Hanni finds success pairing cookies and ice cream by turning cookies into cups to hold the frozen treat. For the cup, Hanni places two ounces of cookie dough on the underside of muffin tins that have been sprayed with oil. He bakes the cups—with the muffin tins upside down—at 325°F for about 11 minutes. As the dough bakes, it slips down the tins to form the cups. After cooling for at least 11 minutes, Hanni twists the cookie cups off the pan and fills them with ice cream and requested toppings, such as sauces and whipped cream. At Sallie Mae there is no seating area, so the cookie cup can make eating ice cream at employees’ desks a neater experience. At Oracle in Redwood Shores, Calif., Ian Farrell, executive pastry chef for Bon Appétit, also serves ice cream with baked goods. He makes whoopee pie sandwiches by stuffing ice cream between mini cakes. Farrell typically serves the frozen sandwiches at catered events. Farrell and his team assemble the desserts to order so diners can pick from a variety of whoopee pie renditions, such as snicker doodle, mint, peanut butter or chocolate, as well as choose from a few ice cream flavors. Then guests can add extras, such as ganache or seasonal berries. Whoopee pies work better than cookies for a sandwich because “a softer whoopee pie doesn’t offer as much resistance when biting into it,” Farrell says. At Golden Valley Memorial Hospital, in Clinton, Mo., ice cream is used to celebrate staff appreciation weeks. “Twice, during hospital/nurses week, we celebrate with free make-your-own sundaes for all staff on all shifts,” says Director of Food & Nutrition Services Cynthia Barron Brouk. Management staff scoop the ice cream for the employees being honored at the event. “July is national ice cream month, so we featured different novelties,” Brouk says. 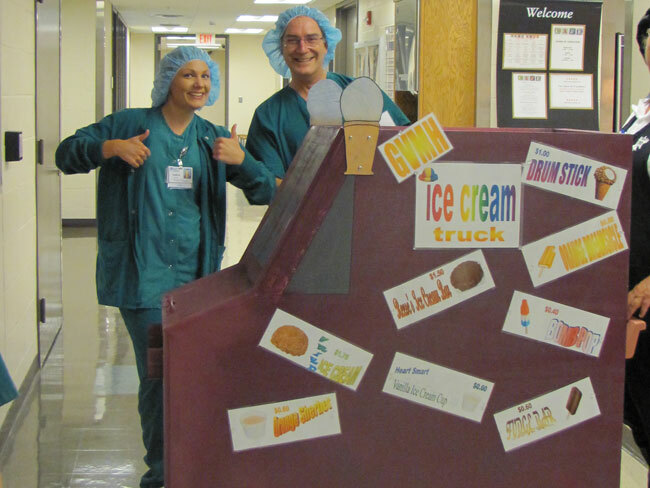 This year’s celebration included a miniature purple ice cream truck that staffers, with the help of friends, built and wheeled around the hospital ringing a bell and delivering frozen treats, rather than waiting for employees to come to the cafeteria. 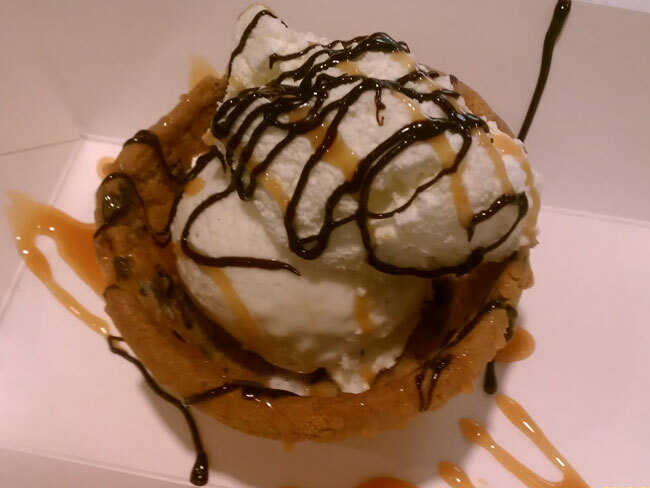 Sallie Mae’s cookie bowl sundae. Golden Valley Memorial’s ice cream truck. One of BYU's ice cream locations. BYU produces 185,000 gallons of ice cream a year.